The SBA Los Angeles District Office would like to honor the contributions of veterans to our economy and to celebrate the accomplishments of veteran, service member and military spouse small business owners nationwide during National Veterans Small Business Week, Nov. 5-9. 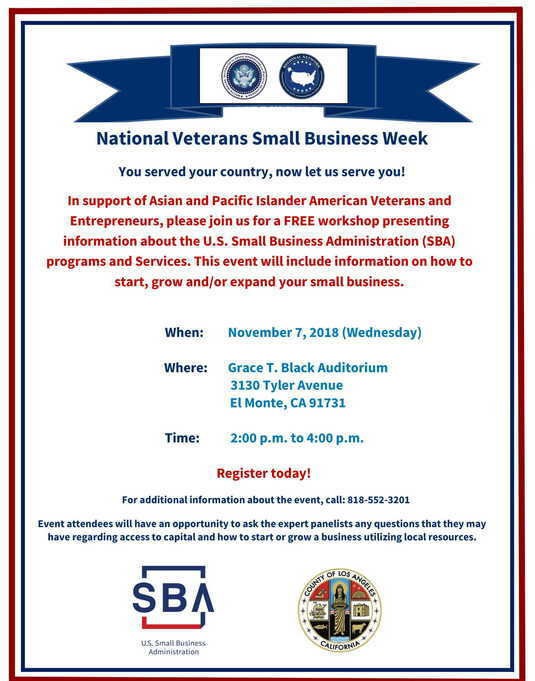 Please see below for upcoming National Veterans Small Business Week news and events. Please join us for an event to honor the service of veterans and to learn how SBA can help your business, as well as what SBA programs and services are available specifically for veterans! SBA Administrator Linda McMahon and U.S. Department of Veterans Affairs Secretary Robert Wilkie today announced a new partnership dedicated to supporting Veteran small businesses. Administrator McMahon and Secretary Wilkie signed a Memorandum of Understanding between the two agencies to collaborate and scale a new pilot program that will offer intensive management and leadership training for Veteran entrepreneurs. President Donald J. Trump recently showed his continued commitment to our nation’s small businesses and to Veterans by donating his second-quarter salary to the SBA. These donated funds will help the SBA with develop and launch the pilot program.